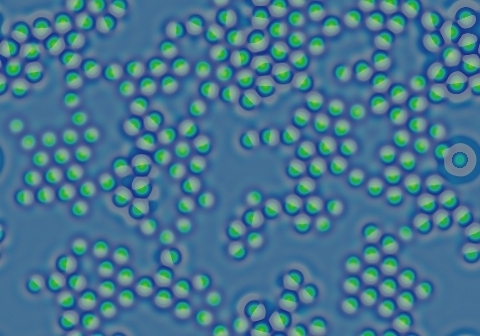 These images and movie demonstrate the behavior of the Gray-Scott reaction-diffusion system with σ=Du/Dv=2 and parameters F=0.0460, k=0.0594. At these parameter values (which are just a bit to the right of my standard grid alignment) we see true negative solitons  areas of locally higher u (light green in these images) that retain a circular shape regardless of the width of the lower (blue) areas surrounding them. The negative solitons (or negatons) arise spontaneously as a standing-wave pattern of concentric rings, in which overlapping waves are essential to negaton formation (evident by the fact that almost all negatons have at least two neighbors from the moment of formation). The negaton with one neighbor seen in the upper-right is viable because of multiple "neighbors" exactly two grid units away. 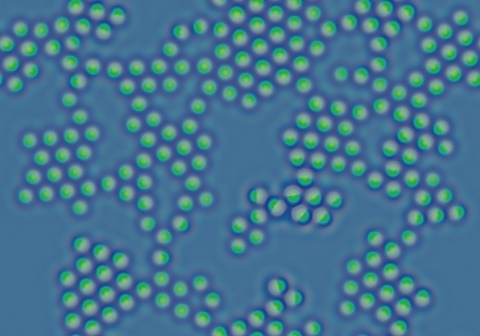 Ordinary noncircular negative solitons are discernable after 600 tu; almost all are circular after another 1500 tu; and drifting to form a hexagonal lattice is mostly complete by 5,000 tu. The few remaining negatons with a sole neighbor die off during the next 20,000 tu. Rearrangement completes in 50,000 to 125,000 tu.